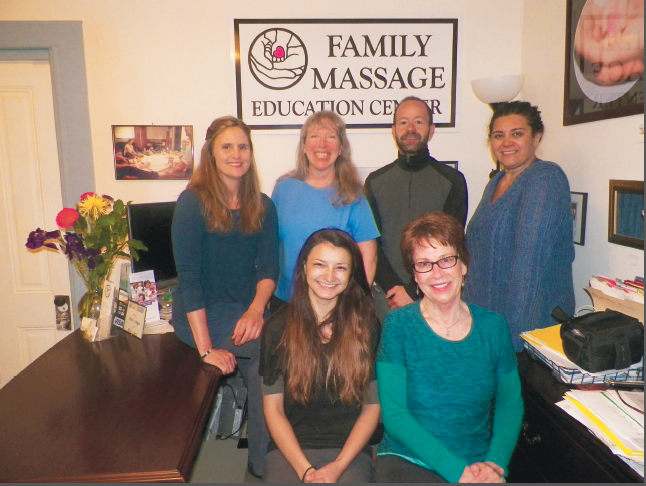 Now celebrating their 7th anniversary here in Ashland, the Family Massage Education Center is truly a one-of-a-kind place for anyone to learn home health massage in couples, singles, pregnancy and parent-baby classes. The general public can have great fun and use these techniques easily at home. JoAnn Lewis and her experienced team of massage therapists and educators, Anastasia Townsend, Karen Scheer, Linda Otto and Luca Moschini are teaching the positive, relaxed touch of massage for all ages to enjoy. “How to do massage for true health at home without getting tired and enjoy giving or getting! That’s what we love to teach for everybody!”, says JoAnn. “Massage is quickly becoming an essential everyday life skill that everyone can do to stay healthy and save healthcare costs. People understand when they need professional massage therapy better, too.” states JoAnn. The Family Massage Education Center offers classes on a one-time, weekly or monthly basis to bring this powerful healing modality to every home. JoAnn, thanks so much for doing this interview with us today. How is the Family Massage Center doing in it’s seventh year in Ashland? We are really enjoying the now hundreds of families touched by learning home health massage with us. People can check out our free lending library of massage books and walk the reflexology trail in the backyard after checking in at the office anytime during regular business hours. Also, we will be adding outdoor curtained gazebo massage therapy appointments this summer and are very excited about that. We always have new and exciting specialty workshops in Aromatherapy, Acupressure, Asian and Tibetan massage for the public and professionals. JoAnn, I would love for you to share your mission statement with us. Thank you, yes, it is: The purpose of the Family Massage Education Center is to promote positive communication and care by learning and sharing healthy, nurturing massage for our daily lives. You personally began your path more than 22 years ago. Please tell us more about your own journey of creating FMEC here in Ashland. I learned from my children how much massage did for them, especially after the trauma of a last-minute emergency C-section delivery of my second child, my son. He was very colicky. A lovely nurse midwife showed me how to do the tummy strokes with him. It went from “a to z” in change. It was amazing! It changed everything in just a few weeks time and he was sleeping soundly. I thought every parent would like to know this and every medical person would like to teach parents this massage that was so effective, so easy and loving to do. In the womb, babies are massaged constantly by the fluid pressure and mama’s movement, so naturally, babies require the same stimulation and relaxation from their parents to grow properly. I think if every parent knew how much they would be helping their child to develop better, sleep more, cry less, be smarter and healthier, then every parent would want to learn and do massage with their babies. It’s such a great bonding quality time together! And then I realized something! Many parents have never had much massage, so how would they know this? So I decided that I needed to teach the parents too, and that’s how Family Massage came to be. My son is very proud that he helped start it all when he was a baby and today at 30, he is also a Massage Therapist like his mom. JoAnn, are there any other organizations or businesses that are offering services similar to FMEC? I have only found a few massage therapy schools and offices who occasionally teach couples classes. One of my students, Joe Lavin and his staff teach consistently in Seattle with a one time couples class that is very popular like we do. But in general I have not found anyone teaching as many classes for all the family like we do here at FMEC. Please let me know if anyone finds something similar!!? The International Association of Infant Massage – USA Chapter has parent-baby classes in every state in the country (see www.infantmassageusa.org to find a parent-baby class in your town). There are instructors all over the country, who I and the other USA Trainers have taught to teach these classes. The Infant Massage program is also in over 70 countries with Chapters in 48 countries like in the US and in just 30 years!! People all over the world are remembering this tradition as most important for babies care, proper development and bonding with their parents to have more socially well-adjusted, compassionate people in the world, too. And now current research from many of the top universities here and abroad show the science of this kind of care and that indeed, massage is very important to health and development. In reflection to the past seven years how are you seeing your work take root and change lives in our community and beyond? We now have parents coming back with each new baby to give them the same quality time in class as with their other children and their older children coming to learn too. It is the most lovely family tradition in healthcare I’ve ever witnessed in all the years I’ve worked in clinics, hospitals and my own office. And then, the couples tell stories of miraculous recoveries from physical injuries and problems and from separation and renewal of loving relationships that this has given them. That is what keeps me going even though many, many people, even in Ashland, have never massaged each other or know massage very well. Something so easy, that once it is learned, people tell me all the time, “Why did I think it would be work? It is so fun. I wish I hadn’t waited so long to learn massage, something so easy and good for us!”, they will say. I can’t tell you how many times I have heard this said to me. You have mentioned seeing more and more dads participating. Please tell us about this new generation of strong men you are seeing? Yes, 10 or 15 years ago, I rarely had fathers in the parent-baby massage classes and they would not use a doll to practice when baby was sleeping or not accepting of it at that moment in class. Sometimes they would take a teddy bear to practice and learn by doing which is best for adults to learn by doing, too. Anyway, TODAY, what a difference! Most fathers come to at least one or often all of the classes and learn with the dolls and I don’t even have to ask them to practice with the dolls!! It is truly a different generation of strong, nurturing, present fathers today. WOW! As part of your work you have had the opportunity to travel around the world. Tell us about some of your recent travels. I have taught the Infant Massage Instructor training in Belgium and Haiti to help start their countries’ Chapters of IAIM, too. More recently I have been teaching in Taiwan and this past month teaching Pre to Postnatal (Pregnancy) Massage for professionals in Taiwan and Hong Kong. What surprised me is that for all the traditions of Chinese Massage which are extensive in each of their countries’ cultures, pregnancy and infant massage is not as prevalent and they are concerned about losing it in the busy life in the cities. So being invited to teach in schools there has been a great honor and delight as I learn more every time about some of the oldest massage methods and techniques as traditional everyday life and medicine, too. There are wonderful traditional health massage places on every city block!! Please talk more about the basis of touch in regards to global communication? When we teach baby massage, we have the parents verbally and physically ask the baby’s permission. They notice how baby says “yes or no” with their body language and cues. It makes them able to “read” their babies cues and children grow up to respect and ASK permission as a way of life. What a great gift for the world and for their own safety and respect for themselves and others!! Fear of touch in our society is also an ever growing issue. How do we as a society keep touch integrated with our every day lives? How we are touched in the first year of life dictates our ability to trust our parents to help us and ultimately how well we trust ourselves and our society. We can live without much food and we can live without many things… but we cannot live without touch. Orphanages like the ones in post-war Romania have taught us that even though babies have enough food and are kept clean, if they are not held and touched well enough, they will close off and die anyway. If a person has had little touch, neglect, and especially bad touch, they grow up to do the same abuses and sometimes worse, so it’s very important to do and teach proper good touch from the beginning with permission and respect. People will discover that the respectful, caring, compassionate touch of massage teaches them to be that way as well, and can grow a healthier society of more well-adjusted and psychologically healthy people. Children are more bonded and attached to their parents through massage and behave more independently with that support by being stronger in themselves. Please talk about benefits to babies and children in receiving massage? Besides the psychological advantages, children grow up to be stronger and more balanced in the health of all bodily functions and motor skills for life. They have better immunity from illness and disease and able to adapt and manage stress. Parents tell me all the time that their children are different from receiving massage all their little lives. I am always very impressed by parents who have children before they learned massage and then other children after they learned. This tells me more of the importance because they have a more true comparison and they tell me the same as others: The children who got massage from them in the beginning of infancy become the ones who always are so respectful, ask permission well, adapt better to any situation and are the first to come and help no matter if others do not. I’ve heard this hundreds of times now that I can’t help but believe that if all parents knew how much this does and how important their daily massage, nurturing touch is, they would all learn the infant massage program from the beginning and for all the life. After all, wouldn’t you want your children to grow up to do this kind of care for you? Can you give us an overview of your 2017 services? Our regular home massage classes are for weekly progressive for 4 to 5 weeks with some one-time classes, too for those who can’t come for more than once. We have a progressive weekend class once a month on a Saturday and Sunday afternoon for weekenders. Mondays or Tuesdays: Couples & Singles classes progressively for 4 weeks (every month). Basic Massage for anyone is on Thursdays and Fridays (one-time class). Home Massage classes are: Weekend afternoons are once a month for weekenders! Pregnancy Partners is on Wednesdays (4 week progressive for pregnancy, labor and postpartum techniques). Parent-Baby Massage is on Saturdays (morning and evening classes – 5 weeks required for babies and parents support to learn progressively). Happy Hands & Feet reflexology class is every last Sunday of the month with a footsoak! ALL classes and specialty workshops can be seen on our website at www.HelloFMEC.com and specific dates are on the class calendar at the bottom of the homepage. You are also offering some special events. Please say more. August 6th will be our first Aromatherapy workshop at the Lavender Fields Ranch of the Essential Three Oil company with owner Caryn Gehlmann and we are very excited to see the distillation process and learn master blending again with Caryn as we have had the classes here in the past. So thrilled to see it in the actual lavender fields!! August 26 & 27 is the traditional Tibetan Massage VITAFLEX 1 for learning the oldest reflexology. And that’s just summer…!!! Stay in touch! In the fall we repeat most of these and The Living Entities of Acupressure Points with Luca Moschini which is an ongoing series of courses. JoAnn you love receiving feedback from your students. What are some of the most recent comments you have receive? Massage offers a number of health benefits. Tell us about some of the most significant research. The Touch Research Institute website catalogues all the major research on massage and there are many studies showing the significant improvements in physical stability, health, injury recovery (usually in half the normal time), better digestion and immunity, sleep patterns and less depression for old and young alike and certainly higher IQ and physical development for babies. The list of benefits is very long now with links to heart health and anti-cancer. Touch is our first language and investing a little time to learn massage goes a long way in all of our lives to heal ourselves. I now understand how daily massage is an important language for a healthy life. Learning massage starts your own family tradition of care. Welcome to your national monument! Cheri Elson Sperber, Drescher Elson Sperber, P.C.